EYE OF THE DESTROYER STREAM NEW SINGLE "PLAGUED WITH REGRETS"
Death metal band EYE OF THE DESTROYER are now streaming their new single "Plagued With Regrets" at New Noise Magazine. The song is the band's first with drummer Joe Randazza taking over vocal duties. 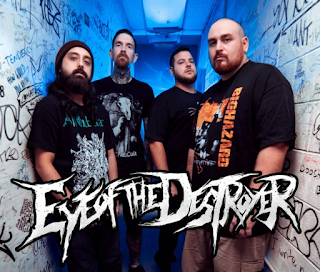 Listen to the song here: https://newnoisemagazine.com/stream-eye-destroyer-plagued-regret.